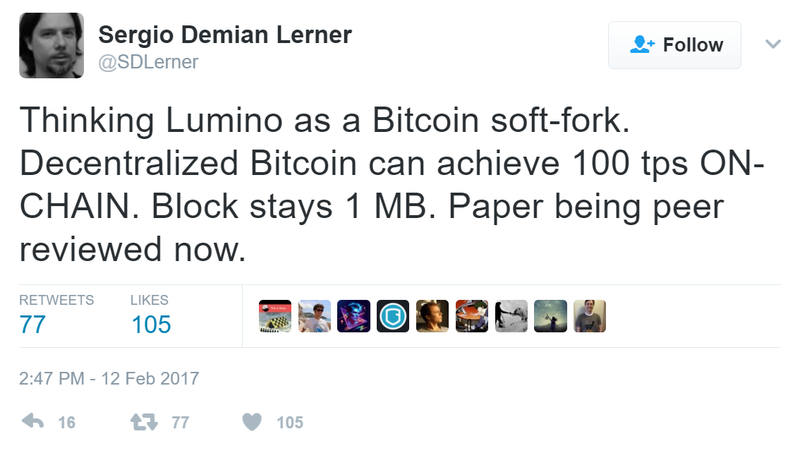 Bitcoin’s block size debate may be getting a new option called Lumino. The proposed Bitcoin scaling solution will supposedly offer an upgrade to 100 Transactions Per Second (tps) without raising the block size or risking a hard fork. At that time, he considered the yet-unnamed project just a sidechain for Bitcoin on the RSK platform. “Can this be used for #Bitcoin?”, a Twitter user asked him. Lerner replied: “As a sidechain, yes. 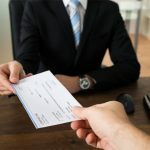 As a hard-fork or soft-fork, it would require a lot of work. Our plan at @RSKsmart is a Bitcoin sidechain”. 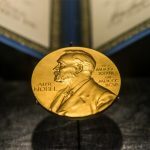 Lerner told Mooti CEO Bradley Chun: “It’s something truly different, looks like hub-and-spoke net, but in the background something different happens”. Since Lerner’s announcement, many people have asked him for access to the white paper. However, he did not publicly respond to those requests and has been quiet about who the reviewers are. While people argue about 2 MB hardfork, we demoed live in Construct how @RSKsmart sidechain allows 100 tps. Quietly, we’re changing history. 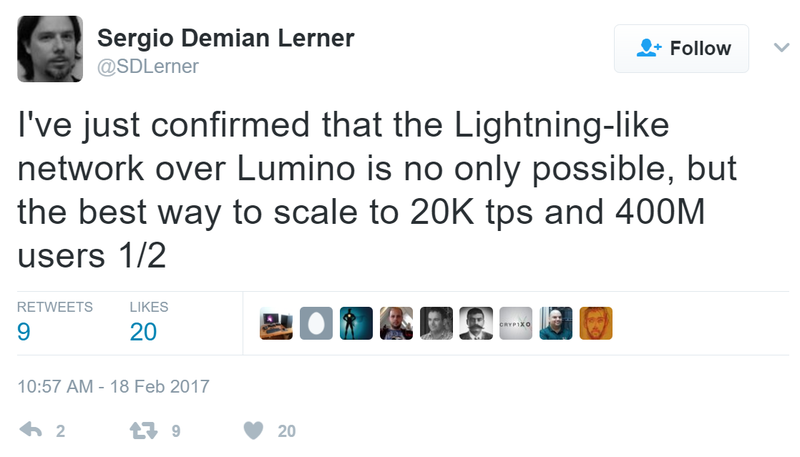 At Bitcoin’s current 3 to 7 tps, Lumino’s proposed 100 tps represents approximately 33 to 14 times more transactions in each block than Bitcoin currently allows, and 6 to 14 times more than it could have after a hard fork to two-megabyte blocks. I achieve 8 bytes per transaction under certain (uncommon) usage patterns. That’s only 64 bits. 64 bits of data is far smaller than each transaction is in a current block, which has somewhere between 18 bytes and several hundreds of bytes per transaction, depending on the number of input and output addresses that the transaction has. So even with the smallest transaction possible, the amount of space it would take up inside a block could be reduced significantly using Lumino. He also mentioned in another tweet that “Lumino is better as a sidechain of Bitcoin (@RSKSmart) to get 10 seconds confirmations, but could be also a Bitcoin soft-fork”. What do you think of Lumino? Let us know in the comments section below. The post Bitcoin Upgrade Lumino Introduces a New Approach to Scalability appeared first on Bitcoin News.